OPT, said, “Our team has been working diligently to iden- tify opportunities to leverage our technologies to address the needs of current and potential customers in subsea environ- ments. These new product offerings provide OPT with the means to better serve customers by expanding its product and service offerings. In addition, this allows us the opportunity to have broader discussions during each customer visit, pro- viding more comprehensive solutions and further establishing our credibility and our ability to address each unique market. OPT’s hybrid ? 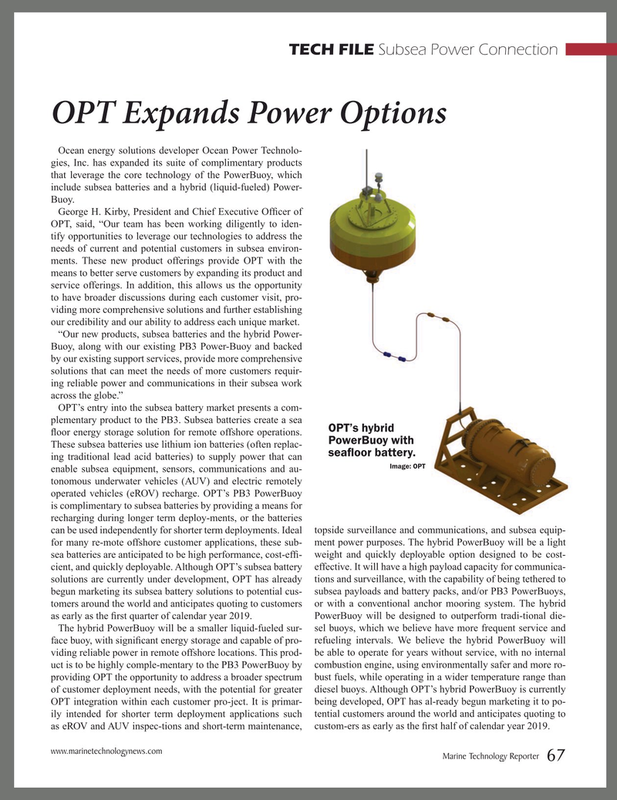 oor energy storage solution for remote offshore operations. OPT integration within each customer pro-ject. It is primar- being developed, OPT has al-ready begun marketing it to po- ily intended for shorter term deployment applications such tential customers around the world and anticipates quoting to as eROV and AUV inspec-tions and short-term maintenance, custom-ers as early as the ? rst half of calendar year 2019.